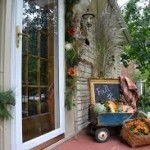 Metallic silver and gold are a great additional to your fall outdoor décor. The rustic twigs juxtaposed with the glitzy metallic accessories offer a modern twist for the door hanger that can’t wait for the holidays. And for that unmistakeable fall look, we’re looking at fall harvest vegetables and foliage in a satin metallic finish; a great complement to your new home style. A simple square door wreath is an elegant yet minimalist twist on the classic round shape. 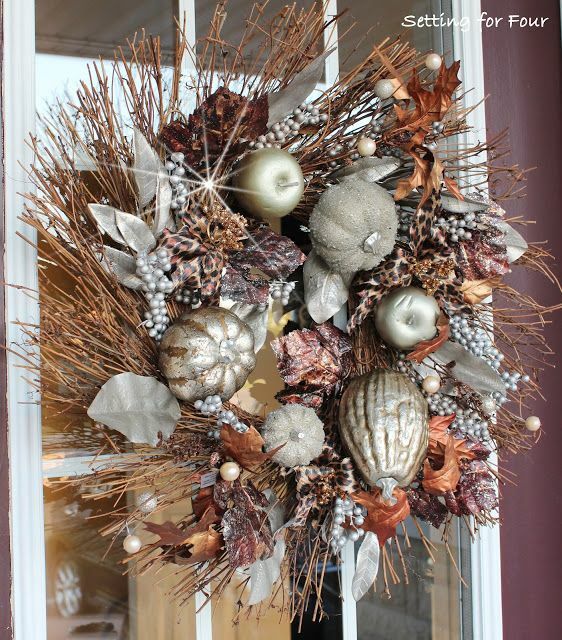 This design works great if you prefer less fussy decorating in the rest of your new home. Pick a colour from the fall family of glorious reds, yellows and oranges that works well with your front door colour. 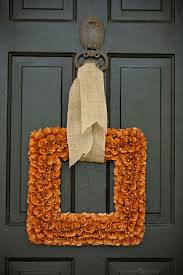 Simple fall flowers like mums would work great for this; adding rich colour and fullness to your front door décor. This rustic yet highly dramatic front door wreath adds loads of visual interest to your front door. This kind of design stands up great to iron work you may have in your front door window panel; offering a nice complement to the lines and curves of your iron work with the free flowing outlier twigs. 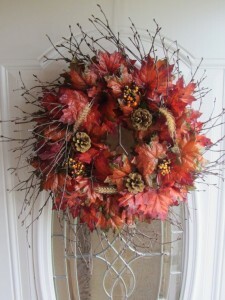 If you have an appetite for rustic fall décor in the rest of your new home, then this front door wreath will do great. You may not be hosting a grandiose feast at your new home this season, but an elegant wine and cheese party is a great way to have an excuse for a gathering. 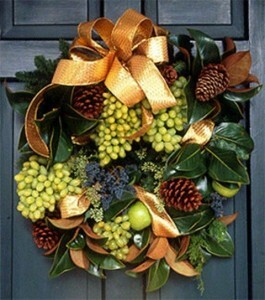 If so, you’ll want to think carefully about your interior and exterior décor and this front door wreath just screams wine and cheese party ahead with the delicate red and sumptuous green grapes and granny smiths, complemented with some pinecones and green foliage and finished off with an elegant gold ribbon. 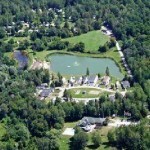 For more great decorating tips and design inspiration for your new home, be sure visit the Mosaik Homes Facebook Page!